I was browsing around rogerebert.com the other day, as I've done regularly since I was about 14-years-old, and I saw a post on Chaz Ebert's blog, an entry in her series called "My Favorite Roger". The entry was from Chicago film critic and site contributor Nick Allen in which he discussed Roger's review of Scooby-Doo 2: Monsters Unleashed (2004). He recalls a couple of quotes from that review, which Ebert opened with a quote of his review of the original Scooby-Doo (2002): "The Internet was invented so that you can find someone else's review of Scooby-Doo." Start Surfing." Of course, that comes off as a bit glib, but the point he's making is true. Some movies are just not meant for particular critics or even particular movie fans. It was Ebert's sentiment that "I'm not the person to review this movie" that really stuck out for me last night, as I watched the new animated feature from Illumination Entertainment, Minions. Oh, is this movie not for me. I only laughed a few times, never very big. I felt no attachment to the little yellow, gibberish-speaking leads. And I found some of this movie to be in poor taste, especially for kids. A little yellow "pill-shaped" creature wearing a red thong is not my idea of good entertainment for children. Maybe I don't get it. I don't have kids of my own, and the two kids I went with, my little cousins (ages 12 and 7), loved this movie. They even said so afterwards. But I also noticed during the screening that another gentlemen who came in with his two girls just before the movie started was shifting and fidgeting and as bored as I was through the whole thing. This movie apparently has a demographic range not much bigger than the distance between my two cousins. 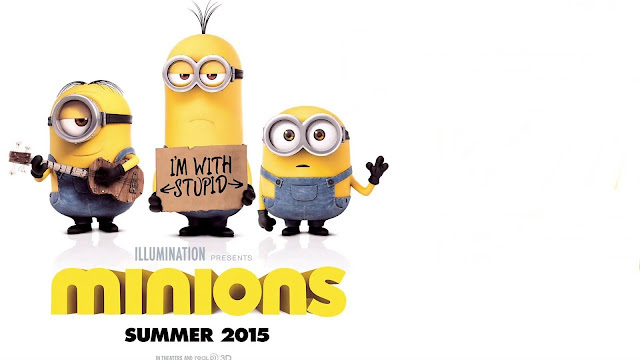 I haven't seen the Despicable Me movies, though I always sort of wanted to. Of course, that's where the Minions originated. This film is their origin story. And I won't say its without some bits of great cleverness. To begin, a narrator (Geoffrey Rush) recounts the story of the Minions from the dawn of time. They've always been around, trying to find an evil master to serve. 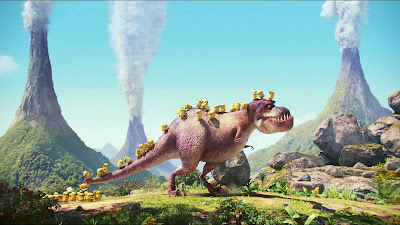 T-Rex, Caveman, Dracula, and Napoleon don't work out, and the Minion "tribe" is left for years of boredom until one brave Minion named Kevin decides its time to find a "boss." They use the word "boss" and they also use the phrase que pasa and the word "banana" and the rest is just a French-Spanish-English-Gibberish hybrid. 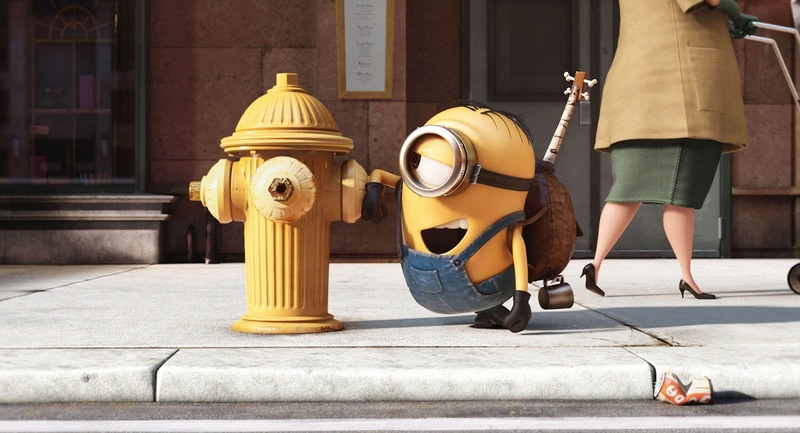 Kevin elicits the help of some other willing Minions, the goofy, one-eyed ukulele player Stuart, and the babyish Teddy bear wielding Bob to journey with him on a mission to find said "boss." They soon land in New York City circa 1968, a time period obviously chosen to interest adults with a soundtrack full of great tunes from the era. This is the best thing about this movie. It even closes with my favorite Beatlesong, a tune from Revolver called "Got to Get You into My Life." The yellow trio slapstick their way around New York and see a TV ad for "Villain-Con," where Scarlett Overkill (Sandra Bullock) will be the headliner, the baddest villain there is. They make their way down there with the help of family of bank robbers led by the voice talents of Michael Keaton and Alison Janney, which provides the most brilliant action sequence of the movie. Overkill takes them in and they soon meet the other great thing about this movie, a character called Herb, Scarlett's husband, voiced by Jon Hamm. The plot takes them with Scarlett to London where a plan is hatched to steal the crown of Queen Elizabeth (Jennifer Saunders), who is given more greatness in character than these writers ever thought about giving to Scarlett. Where was the "overkill," as her name suggests? That's what I want to know. 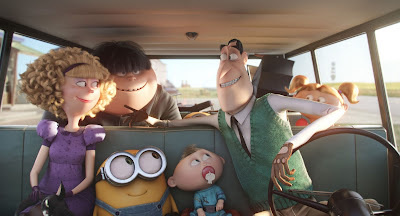 This film, of course, is just a vehicle leading them to Gru (Steve Carrell), who the Minions will eventually work for in the movies that have already been made. I would imagine that another prequel is to come filling in the gap this origin story creates. I understand that there's a plot with adopted daughters in the Despicable Me movies that I'd like to think provides some heart, which is something this movie is severely lacking. I may very well not be the person to review this movie. You maybe should read someone else's review. But the only warmth I felt during Minions was that of the beautiful Ritz Theater, a 70-year-old movie house on Main Street in my hometown (ticket price, $5) and the joy this movie brought my little cousins, whose presence makes me happier than this movie ever even tried to. I'm sorry, girls. I'm glad you liked it. But this one is just not for me. That's a good quote from Ebert. I probably should've started a few of my own reviews off with that. Great review! Yeah, this definitely isn't anything special, but we'll still probably see it get an Oscar nomination or something. The animation was good, I thought, so I won't be surprised to see it nominated, but Inside Out is gonna shut down that category this year. Nothing will beat that one. The KING BOB bit was pretty funny. The point you make is very valid. I know that this is a simple review of a simple movie, most of which I compl agree with. But remember that not everyone who appreciates movies appreciates the same movies or even goes to the movies for the same reason you do. Some just go for sheer entertainment, not the perfect movie. This is definitely a kids movie, and I have no doubts that our students will want to watch on this year's trips. Oh, I'm sure this is a great movie for kids. The humor just isn't for me. I'm not this movie's audience for sure. I mostly enjoyed Minions, but yeah. It's not particularly good. A perfectly fine time-waster (I LOVED the opening sequence), but it probably never should have existed. 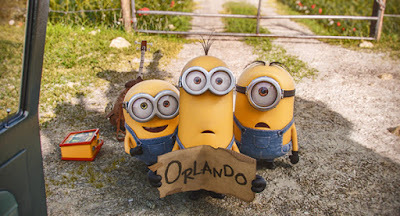 If they HAD to cash in on the MInions, they would have been better served by a TV series or special(s) - they're hard to take in such a large dose as a full-length feature. Definitely didn't need a whole feature. Definitely not for me. Uh-oh! I didn’t know it got such a bad review. I watched it with my kids that time and they liked it. I guess, an adult cannot review such movies. How do they even know about the mind-set of a child? They might like it. It is something to think about. My kids are watching series by Andy Yeatman now days and I believe they love it.